Mariell's elegant 1 5/8" h dangle earrings for weddings, brides, bridesmaids, prom or any special occasion feature graduated Austrian crystals, each richly faceted for maximum sparkle. The delicate earrings are accented with ivory finished pearls and genuine Sterling Silver plated rhinestone rondelles. 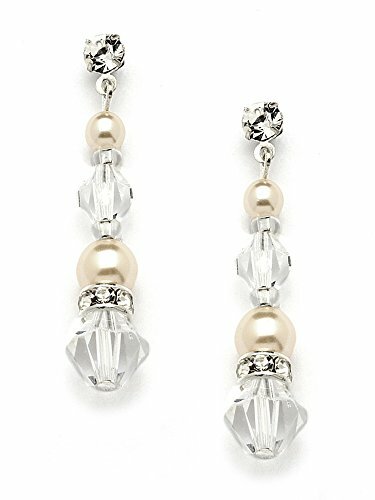 These bridal earrings are meticulously hand-crafted with 6mm and 10mm Austrian Crystals and with 4mm & 6mm off-white cream color simulated pearls. We love the "dress up" or "dress down" versatility of our lovely crystal drop earrings. After your dressy frocks are neatly tucked back in the closet, wear these lightweight glistening beauties with your business wardrobe or jeans and a sweater for just the right splash of sparkle. Complete your special day ensemble with our dramatic matching backdrop accessory style 4082N-I-CR-S, sold separately. We promise you'll adore these top selling stunners or your Money-Back. Treat yourself or someone you love to this top-selling crystal earrings at a fabulous low price. As always, enjoy Mariell's exclusive 100% Risk-Free Purchase and Lifetime Guarantee.